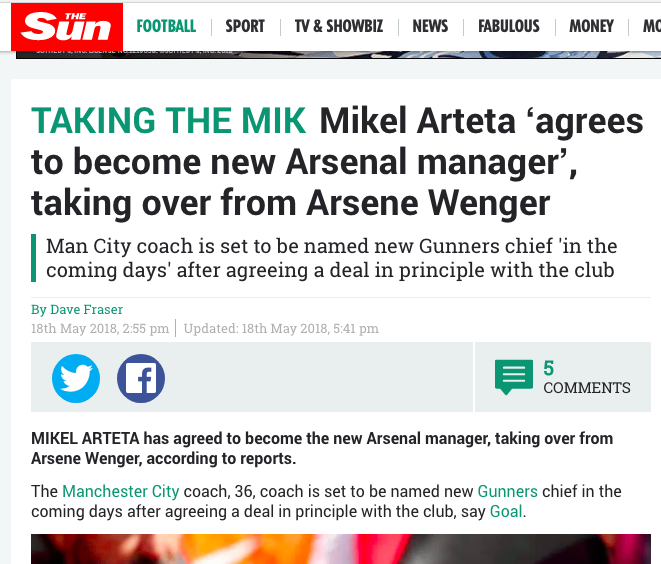 In the rush to say they got the scoop, the BBC declares: “Ex-Arsenal and Spain midfielder Mikel Arteta has agreed to become the club’s new manager.” He has? Because elsewhere on the BBC we can read: “Should Manchester City assistant Arteta leave Etihad Stadium to move to the Gunners, City boss Pep Guardiola’s preference is to bring in 34-year-old Spain and former Barcelona midfielder Andres Iniesta as player-coach.” But Arteta to Arsenal is “agreed”. We read it on the BBC. And as for Iniesta joining Man City, well, Iniesta said in April this year: “I will make a decision to stay at Barcelona or go to China before April 30. I have to assess what is best for me and it will be the most honest for the club.” The BBC reported that. The BBC is wrong. Iniesta is not heading to Man City. 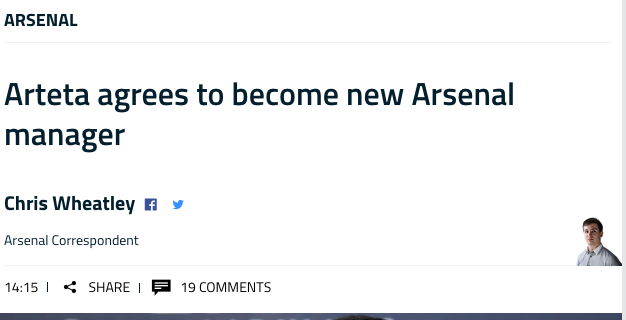 So what’s the source of the Arteta to Arsenal story? It’s Goal.com. The former Gunners midfielder’s return to the club is set to be announced in the coming days as he prepares to replace Arsene Wenger. Mikel Arteta has agreed in principle to replace Arsene Wenger and become the new manager at Arsenal. In principle? Coming days? Any more facts? Goal understands that, while no contract has yet been signed, the announcement of Arteta’s return to the Emirates Stadium will be made in the coming days. Utter guesswork, then. But – yep – Arteta’s looks like the only name on the list (and he’s relatively cheap! ).